Toyoda: We broke our own rules. TOKYO -- Conceding that breakneck expansion led to Toyota Motor Corp.'s current recall crisis, President Akio Toyoda outlined reforms meant to get quality back on track, including more active use of the car's so-called black box crash data recorder. Toyoda, grandson of the carmaker's founder, also indicated he won't sit before U.S. Congressional hearings into the quality lapses that have triggered recalls of more than 8.5 million vehicles worldwide. In Europe, Toyota has recalled more than 1.85 million cars. That includes about 1.8 million units of its eight top-selling models to fix a problem with the cars' accelerator pedals and 52,903 units of the Pruis to modify the software used to manage the hybrid sedans' ABS. • Make better use of the onboard data event recorders to analyze accidents. The overhaul builds on more general improvements outlined by Toyoda earlier this month. Toyoda said then he would chair a newly created a Special Committee for Global Quality. The regional chief quality officers will sit on that committee and be responsible for rounding up customer feedback so the company can react more quickly when problems arise. The global committee will hold its first meeting March 30. Toyota will also equip all models worldwide with a brake-override system that will cut power to the engine if there is a conflicting signal between the gas pedal and brake. It had already announced that all new cars in North America would be getting the technology. Finally, Toyota said it will more actively use the data collected in vehicle event data recorders. These devices are similar to the black boxes on aircraft and record information, such as vehicle and engine speed, in the seconds immediately before a crash. “By reading the data, we will be able to identify causes more quickly,” Shinichi Sasaki, executive vice president in charge of quality, said at the press conference. “I think this will result in substantial improvement in our analytical capability,” Sasaki added. President Toyoda said setting up new technical offices, beginning with the United States, will enable field engineers to assess customer complaints quickly and nip problems in the bud. The goal is to be able to conduct on-site inspections within 24 hours of any reported malfunction. Toyoda said human resource training hasn't kept pace with the carmaker's explosive growth over the past decade. In fact, the world's largest automaker lost sight of matching production to actual demand, a keystone tenet of the company's business strategy, he said. Toyoda said that Yoshimi Inaba, the head of Toyota's U.S. operations, is best suited to testify before U.S. lawmakers because he is most familiar with the local market. 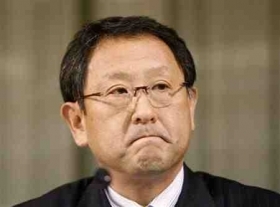 Toyoda said that he still plans to visit the United States to rally workers, dealers and suppliers. The details and timing of the trip are still being worked out, he said. Inaba is to testify March 24 before the House Oversight Committee. The hearing comes amid a fresh investigation by the National Highway Traffic Safety Administration into whether Toyota acted too slowly in announcing its recalls or failed to include enough vehicles.